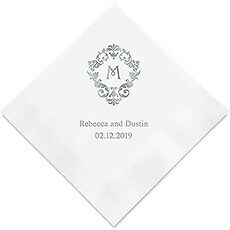 Monogrammed napkins are a beautiful way to add sophistication and style to your wedding reception or anniversary party. We offer various designs, such as the traditional monogram, decorative initials, modern fairytale initials, classic filigree initials, gemstone initials and charming bride and groom initials. 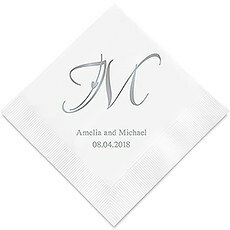 These personalized paper napkins are a budget-friendly way to add warmth, style and personality to your reception. 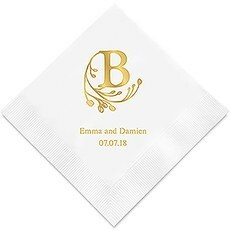 Choose the napkin color and imprint foil color to match your wedding decor, and along with the bride and groom monograms, you can print up to two lines of text. 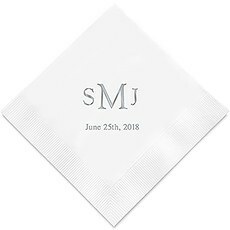 The most common choice here is to have the first names of the couple and the wedding date.These custom monogram printed napkins are available in cocktail (beverage), luncheon and dinner styles. The dinner style has the classic rectangular fold to harmonize beautifully with your formal table setting.Be sure to browse our other design options. We have many wedding logo options, in addition to those shown here. There are traditional choices, such as a stylized bride and groom, wedding cake, just married and joined hearts. Less traditional wedding logos include "love antlers," "drunk in love" and "eat drink and be married." 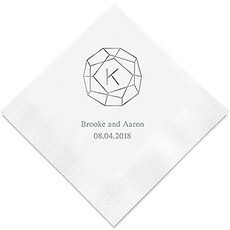 There's the Asian symbol for love, lovebirds, autumn leaves, a chandelier, starfish and other unique logos to celebrate and honor the personalities of the couple.In addition to wedding, these custom party napkins are great for engagement parties, bridal and baby showers, anniversaries, birthdays, graduations and other special events. You'll find specialty logos for these occasions, such as fling before the ring, bridal shower, a stork with a baby, bar mitzvah, baptism, Merry Christmas and season's greetings. 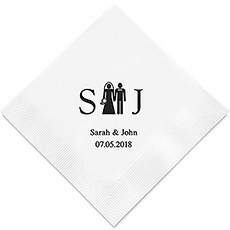 For anniversary celebrations, you can even choose a logo featuring the number of years married.These personalized paper napkins are also great mementos - your guests will probably want to bring one home as a keepsake for their photo album!